Fellow Biafran, lovers of freedom and the blessed of Chiokike Abiama, I bring you greetings. 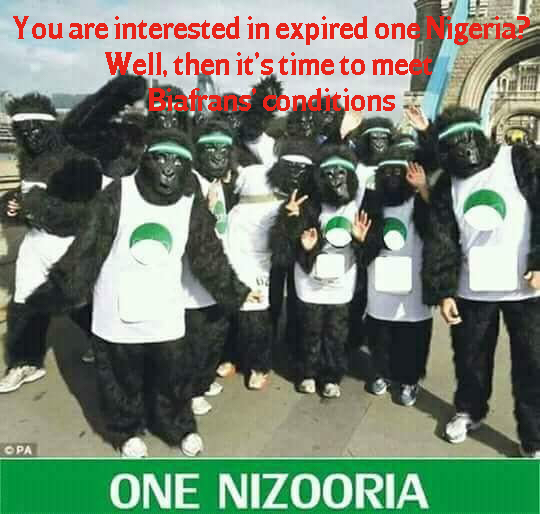 For the past 3 years, the leadership of Indigenous People of Biafra (IPOB), especially during those days our supreme leader Mazi Nnamdi Kanu, severally told us the importance of rewriting the wrongs done to us by this fraudulent British led government of Nigeria and again totally refrain from every election in the whole of Biafra land. For the past 100 years Biafrans had in different ways been subjected into many inhumane treatments which includes, intimidations, imprisonment, tortured, denied our fundamental human rights, bathed with raw acids to death, drowned into muddy waters to death, shot and killed; but for what? Because we are Biafrans asking for freedom to rule over ourselves. The British government had for so long remained criminally silent in all our travails in Nigeria. We have cried beyond our strength, called and still calling for justice. We have continuously pleaded for the help of the United Nations (UN), African Union (AU) Amnesty International, ECOWAS, International Criminal Court (ICC) and other well-meaning and recognized bodies in the world to come to our aid by intervening and prevailing on the greedy, tyrannical British and their company Nigeria to allow us exit this heartless, and godforsaken union forced on us by the British colonial masters. But it seems our pleas and cries for justice has fallen on a recalcitrant ear. Amidst all these sufferings, we have never embarked on any reprisal attacks in seeking vengeance for ourselves. Despite the numbers of times that this fraudulent federal government of this country Nigeria has pushed us beyond limits. We have strongly assured ourselves that retaliatory attacks won't perfectly give us the freedom we desire. Not that we don't have all that it takes to retaliate, but we want to assure the world and beyond that violence is not in our DNA. Mazi Nnamdi Kanu is a royal prince of Afara-Ukwu kingdom, Ibeku Umuahia, despite the meaningful life he was given as a Prince, properly trained by his father, king Eze Israel Okwu KANU, and most of his life were spent abroad, everything was at his beck and call. But despite that he is from a royal family and has everything, yet he was convinced that not all in Biafra land have the kind of life he had, so he gave up his comfort zone in a bid to liberate his own kind from the shackles of slavery. He was determined that even though all the present Biafran leaders have maintained criminally silence in the sufferings of his people, he can't afford to be a party to it. He rekindled the long dying spirits of freedom in every Biafran. He echoed the undiluted truths and didn't fear no one. He came down to Nigeria to further solidify his quest for the freedom of his people. He never wanted it to be as if he was in London sending people to confront their oppressors which had resulted in deaths of thousands of Biafrans. He knew that we are ruled by triggers happy, self-centred and bloodletting egomaniacs. He came down to Nigeria and immediately, he was arrested, detained and sent to prison for two years without trial. But through the help and mercy of Chiokike Abiama, and resoluteness of Biafrans he was later released on bail. He came out of prison and intensified the quest for the freedom of his people. He immediately declared boycott of elections in Biafra land and demanded a date for plebiscite to determine our fate “no referendum date, no election in Biafra land". Enemies saw him as the only thing that would cut off their evil gains, they plotted to kill him, invaded his house through the devilish operation python dance 2 which left hundreds of IPOB members dead including a dog. Till date, our leader Mazi Nnamdi Kanu and his parents are missing, and nowhere to be seen since last year September 14, 2017. They proscribed us and tagged us terrorists. Despite all these evils against us, we have refused to succumbed to their evil wish of abandoning our freedom which is Biafra. We are determined to get our freedom come rain come sun. We have concluded that until our freedom comes into fruition, we will never participate in any election in our land. We have also decided to conduct a referendum. Any sensible human with conscience upon seeing how determined we are amidst all these ill treatments would have allowed us to go, but because of how heartless they are and will continue to be, they still want us to continue to vote for them; promising us heaven and earth if voted which we all know that it is a smokescreen. (1) Bring back to life over 6 millions Biafrans killed before, during and after the genocides Britain committed through Nigerian military against us from 1967-1970 and compensate all families of Biafrans affected in that genocides. (2) Pay all Biafrans everything they lost after "No victor no anguish" was declared. (4) Supply us with 24/7 uninterrupted power supply in all Biafra land. (8) Arrest and prosecute every human being that had a hand in that evil operation python dance beginning from Muhammadu Buhari and Tukur Buratai. (9) Lift the terrorist tag on us and de-proscribe us with immediate effect. (10) Provide an employment for all Biafran youths. If they fulfil all these demands within 6 months between now and January 2019. My brothers and my sisters, we will know they really love their expired contraption called Nigeria. But if they don't fulfil all these within this stipulated time, tell them to go get a map, get a taxi and then drive to hell and roast. Spit on anyone's face that would encourage you to go get your PVC just to continue recycling all the greedy leaders. Fellow Biafrans, please get prepared for our forthcoming Biafra referendum and decide your fate either to be free or remain a slave in Nigeria.